This marvelous mushroom and barley soup does indeed deliver! If you love mushrooms, this soup recipe is chock full of them. Add in the barley and you have some really great ingredients that deliver high on protein. 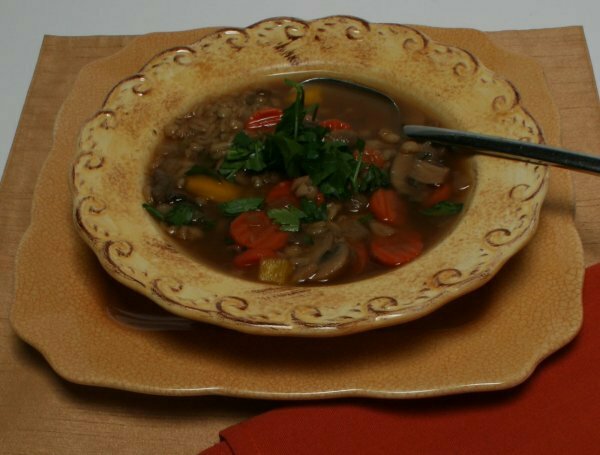 There are about 11 grams of protein in this terrific mushroom and barley soup. The other ingredients, such as the carrots and shallots (including the green), as well the great seasonings all combine to make this a thick, delicious soup that you will savor again and again. Mushrooms are a good source of B vitamins, such as riboflavin, niacin and pantothenic acid, and essential minerals such as selenium, copper and potassium. And of course, we all are aware of the tremendous health benefits of barley such as helping to lower blood glucose levels. So grab a couple of packages of mushrooms and a box of barley, throw in the other ingredients you will need and cook up this wonderfully delicious soup - you'll be glad you did! Heat oil and butter in large pot over high heat. Add onions and carrots. Cook about 2 minutes, stirring frequently. Add mushrooms and shallots. Cook an additional 4 minutes, continuing to stir frequently, until onions and carrots soften and mushrooms wilt. Add wine, thyme and oregano. Reduce heat to low. Stir and scrape browned bits from the bottom, and cook an additional 5 minutes. Stir in stock, barley, salt and pepper. Increase heat and bring to a boil. Reduce heat, cover, and simmer until barley is tender, about 40 minutes. Stir in yellow pepper and 1/3 cup parsley, and simmer for about 3-4 minutes. Garnish with remaining parsley and serve. Per serving: 260 calories, 9 g total fat (2 g saturated fat), 34 g carbohydrate, 11 g protein, 6 g dietary fiber, 330 mg sodium.